Provo • It was all there for the taking Saturday night for the BYU Cougars. Momentum from a surprising season-opening win at Arizona. A decent, but beatable Pac-12 opponent that lacked firepower but had a better-than-expected defense. An interested, though somewhat disappointing crowd of 52,602 eager to jump back on the bandwagon after last year’s disaster. Call it an opportunity lost. After a stalemate in the first half, Cal made the important plays and better defensive adjustments in the second half and scratched out a 21-18 win at LaVell Edwards Stadium, a win that quite likely will get the Bears back to a bowl game when all is said and done. BYU, meanwhile, heads back to the drawing board with more questions than answers after that promising start in Tucson. If the Cougars don’t make a bowl — and that’s far from a given, with very few gimme games even in the last half of the schedule — the egg they laid on Sept. 8 could come back to haunt them. The offensive drought was almost inexplicable, coming as it did on the heels of last week’s 392-yard, 28-point performance against Arizona. The Cougars had eight miserable possessions of 6,-5, 6, 0, 5, 6, -11 and 0 yards from late in the second quarter until late in the game. Indeed, the opportunities were there — and BYU couldn’t capitalize. • BYU still lacks offensive playmakers. Without the threat of getting beat deep, Cal defenders packed the box in the second half and took away BYU’s rushing attack. Dylan Collie did break free for what would have been a huge gain, but Tanner Mangum’s throw was a tad late and Collie dropped the ball as a Cal safety closed in. Even with a lot of short and medium-range throws, Mangum was 22 of 41, with two interceptions. • Tanner Mangum isn’t improving. 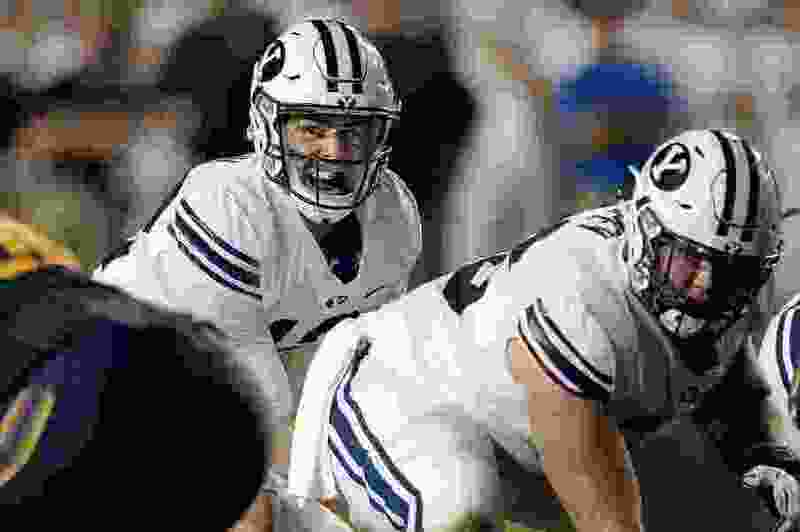 The senior showed signs of returning to his 2015 form in the 28-23 win over Arizona with a brilliant third quarter, but made some of the same mistakes that haunted the Cougars in 2017. The fourth-quarter interception he threw when BYU was in field goal range was especially costly. “It’s got to get better,” Sitake said of Mangum’s performance. • Cal’s defense was much better than Arizona’s. The Cougars were buoyed up by the way their offensive line manhandled Arizona’s front seven last week, but that turned out to be fool’s gold because the Wildcats were pounded 45-18 by Houston Saturday. BYU running back Squally Canada had 12 carries for 56 yards in the first half but had zero yards on just four carries in the second half. Dayan Ghanwoloku, safety. The junior returned a fumble that was caused by Butch Pau’u’s big hit and returned it 36 yards for BYU’s first touchdown in the third quarter. Ghanwoloku also recovered a muffed punt to give the Cougars excellent field position early in the fourth quarter. Runner-up: Cal backup quarterback Brand McIlwain. The Bears used the freshman effectively as a runner, and he picked up a game-high 74 yards on 16 carries. Unlike what Cal did in slowing Canada, BYU didn’t make the second-half adjustments to slow McIlwain. Cal defensive back Traveon Beck’s interception in the fourth quarter. BYU was in field goal range and poised to make it a one-score game, but Beck intercepted Mangum’s pass on third-and-21 at the Bears’ 16 and returned the pick 20 yards. Not getting points after taking over at the Cal 16 with 12:37 remaining proved costly for the Cougars. Runner-up: Cal receiver Kanawai Noa’s 52-yard touchdown reception. A mix-up in BYU’s secondary left Noa completely free on the east sideline and Chase Garbers easily connected with Noa for the touchdown that put the Bears ahead 14-3. “You have to have a short-term memory and just move onto the next play after a mistake,” said Ghanwoloku, who took the blame for the miscommunication on defense. Freshman Gunner Romney made his first catch, for 18 yards, and finished with two receptions for 29 yards. Freshman Skyler Southam’s first field goal attempt was good, from 36 yards. Redshirt sophomore Isaiah Kaufusi made his first career interception and returned it 15 yards. Senior Zayne Anderson made a career-high 12 tackles and recorded his first tackle for loss. The Cougars will face their third-straight Power Five conference team Saturday when they travel to Madison, Wis., to take on No. 5-ranked Wisconsin. The game will kick off at 1:30 p.m. MDT and will be televised by ABC. The Badgers (2-0) walloped New Mexico 45-14 Saturday after a slow start and crushed BYU 40-6 last year in Provo.